AWS re:Invent, the public cloud provider's signature yearly event, is back again. And the conference continues to expand, taking up more of the Las Vegas Strip each year. This year's show figures to bring much of the same: a look into new AWS products and services, sessions to help AWS professionals expand their deployments and a gathering place for cloud enthusiasts around the globe. AWS re:Invent 2017 will bring together developers, administrators, DevOps engineers, big data experts and other IT professionals, all of whom use the AWS cloud for their own purposes and needs. 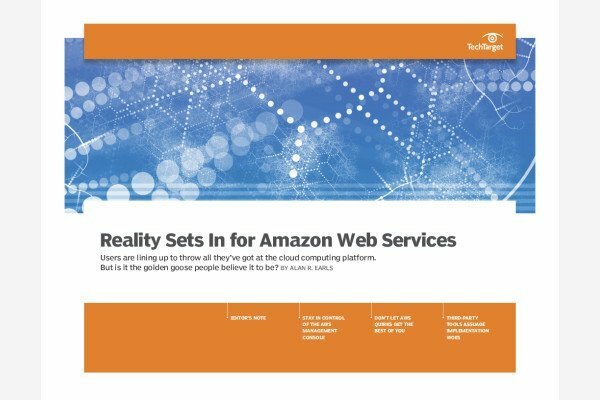 As we enter the annual AWS conference, questions are emerging about the cloud provider's strategy, especially for serverless computing, containers and AI. What will this year's keynote addresses reveal, and how can enterprise attendees take advantage of what they learn at the show? IT professionals across a variety of roles can use this AWS re:Invent 2017 essential guide for news updates directly from Vegas and to stay on top of the latest AWS tools and skills. Cloud admins require a specific set of skills and tools to effectively manage an AWS deployment. And those skills can vary based on how an enterprise implements the public cloud. Businesses with a hybrid AWS environment, for example, can benefit from Elastic Compute Cloud (EC2) Systems Manager, a set of services that lets admins automate management tasks across cloud instances and on-premises servers. For other hybrid users, familiarity with VMware Cloud on AWS will become a must. Meanwhile, all AWS admins -- regardless of their deployment model -- continue to prioritize security, account management and simplified migration processes. Learn which recent AWS tools and services can help meet your needs. Amazon continues to make an effort to win over the developer community, incorporating technologies such as serverless computing and containers into its portfolio. Indeed, AWS unveiled several new developer services at last year's show, and app dev tools will likely share a significant portion of the spotlight this year. The cloud provider also continues to add to its arsenal of EC2 instance types, which include options for accelerated computing and high-performance workloads. Get caught up on AWS app dev and resource provisioning methods ahead of re:Invent 2017. These days, it's not enough to deploy quality applications; you've got to deploy -- and patch -- them quickly. As such, DevOps takes on a greater role with many enterprises in the cloud, as they build continuous integration and continuous delivery pipelines to push out new applications and updates. AWS provides automation capabilities across multiple accounts and regions, allowing DevOps teams to quickly specify the compute and security resources they need. But some experts believe AWS has room to grow. Get started with architecture automation with these helpful tips. As enterprises shift more workloads to AWS, their data management and analytics practices need to keep up. It can be a difficult task to properly store and manage data, as it often comes in a range of formats and from a variety of heterogeneous systems. IT teams should evaluate AWS tools, including Glue, as well as the provider's various database options, such as Aurora. For multi-cloud users, it's critical to know how AWS' data management services compare to those from Microsoft and Google. And AWS shops with AI and big data implementations should ensure their data analysts are up to speed with technologies such as Amazon Machine Learning, Athena and Kinesis.